Annual. Culms decumbent; 20-100 cm long. Ligule an eciliate membrane. Leaf-blades 3-25 cm long; 3-10 mm wide. Inflorescence composed of racemes. Racemes 2-12; digitate; unilateral; 6-22 cm long. Central inflorescence axis 0-5 cm long. Rhachis narrowly winged; angular; glabrous on surface, or with scattered hairs; scabrous on margins. Spikelet packing contiguous; 0.3 their length apart. Spikelets appressed; in pairs. Fertile spikelets pedicelled; 2 in the cluster; all alike, or heteromorphic (as to indumentum). Spikelets comprising 1 basal sterile florets; 1 fertile florets; without rhachilla extension. Spikelets elliptic; dorsally compressed; acute; (2-)2.5-3.3(-3.7) mm long; falling entire. Glumes two; dissimilar; shorter than spikelet; thinner than fertile lemma. Lower glume ovate; 0.2-0.4 mm long; 0.1 length of spikelet. Upper glume lanceolate; (0.5-)0.6-0.75 length of spikelet; membranous; 3 -veined. Upper glume surface pubescent; hairy between veins. Upper glume apex acute. Basal sterile florets barren; without significant palea. Lemma of lower sterile floret elliptic; 1 length of spikelet; membranous; 7 -veined; with equidistant veins, or with unevenly spaced veins; puberulous, or pubescent, or setose, or villous; hairy between veins; eciliate on margins, or ciliate on margins; acute. Fertile lemma elliptic; 2-3.7 mm long; cartilaginous; much thinner on margins; grey, or dark brown; without keel; 3 -veined. Lemma margins flat; covering most of palea; ciliate. Lemma apex acute. Palea cartilaginous. Europe: southeastern. Africa: north, Macaronesia, west tropical, west-central tropical, northeast tropical, east tropical, southern tropical, south, middle Atlantic ocean, and western Indian ocean. Asia-temperate: Soviet far east, Caucasus, western Asia, Arabia, China, and eastern Asia. Asia-tropical: India, Indo-China, Malesia, and Papuasia. Australasia: Australia and New Zealand. Pacific: southwestern, south-central, northwestern, and north-central. North America: Mexico. South America: Mesoamericana, Caribbean, northern South America, western South America, Brazil, and southern South America. Nativa en Colombia; Alt. 0 - 3000 m.; Amazonia, Andes, Guayana y Serranía de La Macarena, Llanura del Caribe, Orinoquia, Sierra Nevada de Santa Marta, Valle del Cauca, Valle del Magdalena. Annual, or perennial; short-lived; caespitose. Culms prostrate; slender; 20-50 cm long; rooting from lower nodes. Leaf-sheaths glabrous on surface. Ligule an eciliate membrane; 1-2 mm long. Leaf-blades lanceolate (narrowly); 3-8 cm long; 2-5 mm wide. Leaf-blade surface glabrous; hairless except near base. Leaf-blade apex acute. Inflorescence composed of racemes. Racemes 3-9; digitate; erect; unilateral; 4-8 cm long. Rhachis narrowly winged; flattened; 0.5 mm wide; glabrous on surface; scaberulous on margins. Spikelets appressed; in pairs. Fertile spikelets sessile and pedicelled; 2 in the cluster. Spikelets comprising 1 basal sterile florets; 1 fertile florets; without rhachilla extension. Spikelets lanceolate; dorsally compressed; acuminate; 2.2-2.8 mm long; falling entire. Glumes two; dissimilar; shorter than spikelet; thinner than fertile lemma. Lower glume ovate; 0.2 mm long. Upper glume lanceolate; 0.5 length of spikelet; membranous; 3 -veined. Upper glume surface pilose; hairy between veins. Upper glume apex acute. Basal sterile florets barren; without significant palea. Lemma of lower sterile floret elliptic; 1.1 length of fertile lemma; 1 length of spikelet; membranous; 7 -veined; with unevenly spaced veins; pilose; hairy between veins; pubescent on margins; acute. Fertile lemma elliptic; cartilaginous; much thinner on margins; yellow to light green to grey; without keel; 3 -veined. Lemma margins flat; covering most of palea. Lemma apex acute. Palea cartilaginous. Asia-temperate: China and eastern Asia. Asia-tropical: Indo-China. Alabama, Andaman Is., Argentina Northeast, Argentina Northwest, Arizona, Arkansas, Aruba, Austria, Bahamas, Belize, Bolivia, Brazil North, Brazil Northeast, Brazil South, Brazil Southeast, Brazil West-Central, California, Caroline Is., Cayman Is., Chile Central, Chile North, Colombia, Connecticut, Cook Is., Costa Rica, Cuba, Czechoslovakia, Delaware, District of Columbia, Dominican Republic, Easter Is., Ecuador, El Salvador, Fiji, Florida, French Guiana, Galápagos, Georgia, Great Britain, Greece, Guatemala, Guyana, Haiti, Hawaii, Honduras, Illinois, Indiana, Iowa, Italy, Jamaica, Jawa, Kansas, Kermadec Is., Leeward Is., Louisiana, Madeira, Marcus I., Marianas, Marquesas, Marshall Is., Maryland, Masachusettes, Mexico Central, Mexico Gulf, Mexico Northeast, Mexico Northwest, Mexico Southeast, Mexico Southwest, Mississippi, Missouri, Nauru, Nebraska, Netherlands Antilles, New Caledonia, New Guinea, New Jersey, New Mexico, New South Wales, New York, New Zealand North, New Zealand South, Nicaragua, Nicobar Is., Niue, Norfolk Is., North Carolina, Northern Territory, Ohio, Oklahoma, Panamá, Paraguay, Pennsylvania, Peru, Phoenix Is., Portugal, Primorye, Puerto Rico, Queensland, Samoa, Sardegna, Society Is., Solomon Is., South Australia, South Carolina, Spain, St.Helena, Suriname, Tasmania, Tennessee, Texas, Tokelau-Manihiki, Tonga, Trinidad-Tobago, Tuamotu, Tubuai Is., Turks-Caicos Is., Uruguay, Utah, Vanuatu, Venezuela, Venezuelan Antilles, Victoria, Virginia, Wake I., Wallis-Futuna Is., Western Australia, Windward Is. 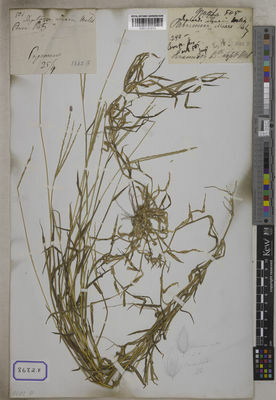 Digitaria chrysoblephara Fig. & De Not. Panicum linkianum var. minus E.Fourn. Panicum sanguinale subsp. marginatum (Link) Thell. Boonsuk, B., Chantaranothai, P. & Hodkinson, T.R. (2016). 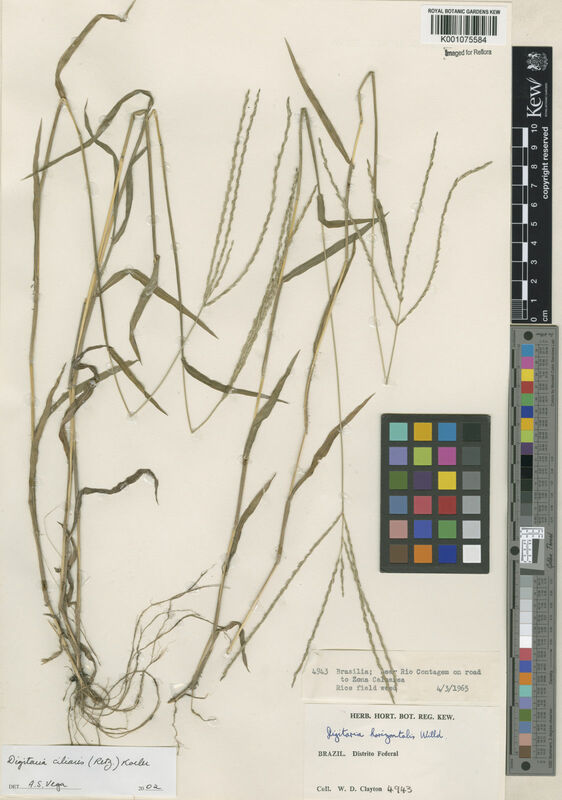 A taxonomic revision of the genus Digitaria (Panicoideae: Poaceae) in mainland Southeast Asia Phytotaxa 246: 248-280. Vázquez Pardo, F.M., Márquez García, F. & Blanco Salas, J. (2014). 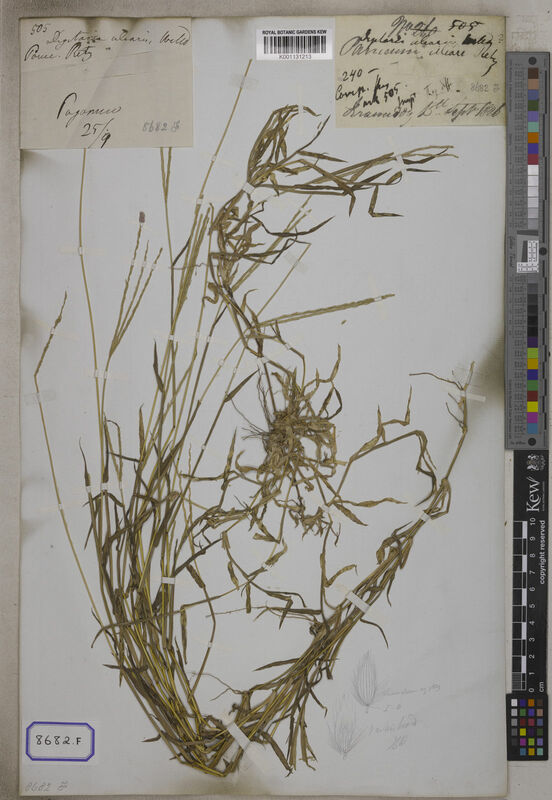 084.- Digitaria ciliaris Folia Botanica Extremadurensis 8: 86-91. Sánchez-Ken, J.G. (2012). 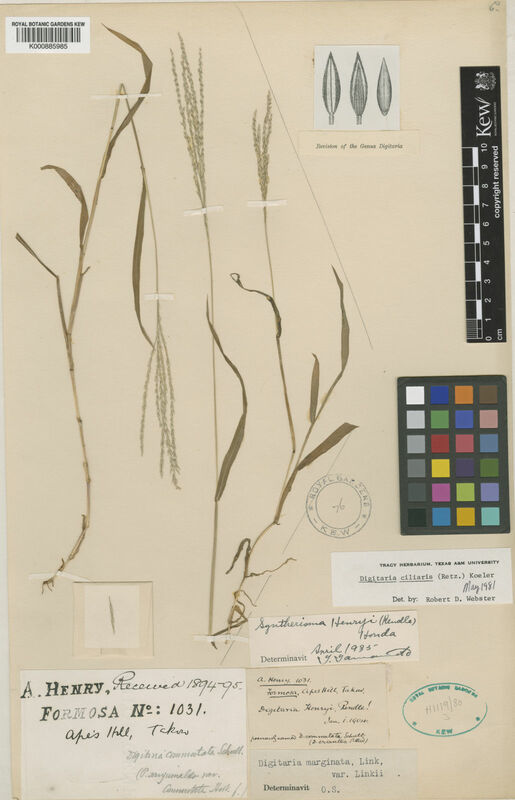 A synopsis of Digitaria (Paniceae, Panicoideae, Poaceae) in Mexico, including the new species Digitaria michoacensis Acta Botanica Mexicana 101: 127-149. Instituto de Ecología A.C.